Take a minibus tour to the museum. It was founded in 2001 by Kevin Moore along with a team of experienced curators and researchers at the venue’s first site in Preston. In 2012 it moved to the stunning Urbis building in Manchester city centre. The National Football Museum was founded to preserve and conserve important collections of football memorabilia. It also aims to educate through exhibitions and celebrate the game as an important part of English heritage and culture. Stretching over 4 floors, the museum welcomes everybody (not just die hard football fans) and is very family friendly. The museum has been designed to encourage interaction and there are interactive objects, games and displays throughout, for all ages. It is also the ideal place for a children’s birthday party, with various packages available including guided tours and food in the museum café! 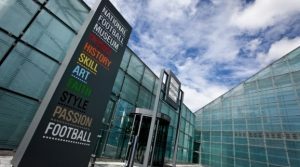 As you may expect the museum is patronised by some big names, with Sir Bobby Charlton as President, Sir Alex Ferguson, Sir Tom Finney and Sir Trevor Brooking as Vice Presidents and Mark Lawrenson as Special Ambassador. The museum boasts an impressive range of collections and holds the world’s finest examples of football artefacts and archives. This is probably the finest single collection of football memorabilia in the world. The collection was built up by Harry Langton, a London journalist with a life long passion for the beautiful game. His collection started with a 5 shilling small print in the 1950s, purchased by Harry’s wife, Ann. Harry went on to collect further items throughout his life, but sadly died before the museum was opened. The collection includes paintings, prints, sculptures, ornaments, football toys and games; and the FIFA Book Collection – over 1200 books including rare yearbooks, annuals and club histories from the 1920s onwards. This is a relatively small but very significant collection, reflecting the career of one of England’s all time greats. The collection includes correspondence, playing kit and items relating to the retirement of Sir Stanley. This collection provides an insight into all aspects of the history and development of the world’s oldest professional league, which was founded in 1888. The collection consists of handbooks, transfer lists, programmes and many other books, which have proven to be a fantastic research tool for the museum. There is also a large selection of trophies no longer used by the Football League included in the collection, with some being on display in the museum. As the football museum is in central Manchester it comes under our minimum fair if you want to book a minibus to here. Why not make a day of it and visit old Trafford and Eastland’s and then a spot of tea at the Trafford centre. We have invented a hour by the hour service for things like this with prices starting from only £25 a hour for a 8 seater and driver make the most of your time in Manchester.